Eleven weeks lived in lands not my own have been instructive. How can they not have been? Perhaps the most curious realization (something I have suspected since childhood but could neither admit nor prove) that I am an alien in each environment where I find myself. Yes, we are distinctively foreign in places where the language and customs differ dramatically from our own home turf—like being in Egypt a few years ago on a Missouri Synod Lutheran tour to “walk the land where Jesus walked”; the foreign-ness evident at several levels, the M.S. Lutherans as much or more foreign than the Arabic Egyptians (the latter simply foreign; the former downright creepy)—but that instinctive sense of not belonging shrouds me when I am “home” as well. Even in the greater U.S. of A., for example, being in Caruthersville (the oh-so-Southern boot heel of Missouri) is alien, but so is being in the Stop-and-Go a block from my house in Fargo. Attending Pentecost Sunday service in a Chattanooga church a few months ago—as wondrously insightful as it may have been—was neither more nor less comfortable than attending a colleague’s lecture at MSUM. In these and other situations, it is not the fear of making a misstep—of ausfahrt-ing when I ought to eingang (which is its own awkward adventure)—it is the fundamental knowledge, my special seventh sense, that I simply don’t belong. Like David Bowie’s character, I have fallen to Earth and found myself trapped in a form unlike the real one I cannot now recall. The DSM-V isn’t handy, so support from the APA will have to wait, unless any of you can suggest a terrestrial dysphasia, dysmorphia, dyspepsia not already on the books. How much longer must I wait for the rescue ship, green ray or fold in space to take me home? More malignly, why was I sent here in the first place? The interruption in my reportage must have been noted by someone. I have a husband, a house, a job, a host of friends and acquaintances that should suffice; should be context enough for a life of purpose and meaning. Aspiration and longing are my constant companions. I have a body of acquired knowledge and the mental faculties for critical thinking. Occasional flashes of insight are cosmic crumbs that lead me along this path to I-know-not-what-nor-when. And all the while, the inability to “fit” gnaws always at my gut. Having just watched a BBC documentary, an interesting possibility arises: could I be autistic? Last Tuesday—Mardi Gras—found me in Binche (pronounced bansh), a community of moderate size in Wallonia, the southern French-speaking half of Belgium. If one of the UCL faculty hadn’t stopped at our table during lunch on Monday, I wonder if either Paul or I would have known about this peculiarly Belgian beginning to the Lenten season. Technically, Carnaval de Binche is a four-day affair, from Saturday and through the weekend, building to fat Tuesday, with all the debris and detritus (and comatose revelers) swept away in time for Wednesday’s Lenten smudge. Most of us boarded morning trains in Brussels for the Tuesday culmination, wondering how it might compare with more familiar celebrations at places like Sydney, Rio or New Orleans, closer to home and personal experience. Whatever images I’d conjured were quickly dispelled passing through the station door onto the south side of a sad landscaped square defined by buildings of the 19th and 20th centuries. The station itself is the best of the lot, a grand Gothic Revival pile erected in happier financial times. [Half the passenger benches trackside consist only of their cast-iron brackets, the planks and backs long gone the way of wood left to its own devices.] To the left and right were typical narrow commercial fronts, shops on the ground level and apartments above. Opposite the station is an eminently regrettable apartment block more typical of the former Iron Curtain countries; I would have guessed Kutna Hora on a good day. But the visual display presented by Binche was quickly displaced by the sonic experience: incessant snare-drumming from every direction. 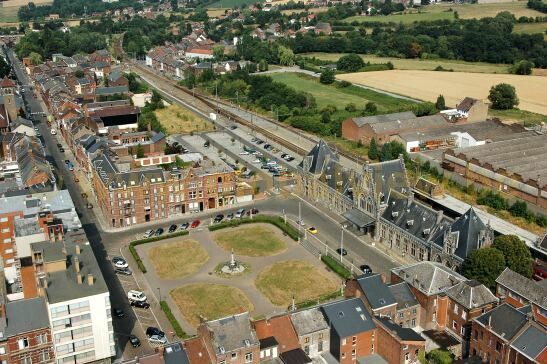 Moving slowly up the west side of the square (toward its only public house) was a clutch of Gilles, chief characters in the Carnaval de Binche and participating only in Tuesdays events. Not speaking French, I’ve been left to google their history and role in the larger story. But their strange rhythmic behavior—hardly marching as we know it—was mesmerizing in the same spastic way that a rugby scrum defies description. I haven’t checked youtube, but I’ll bet there’s something there to satisfy your curiosity. It turns out there are random gangs of these Gilles moving about the city as Monty Python might have staged the Normandy invasion, bumping into one another like mating moths. Not a particularly worldly person, I was left to the limited range of cards on my mental rolodex for comparison. Happily, Cecil Elliott came once again to my rescue. In the winter of his first year at NDSU—he came mid-year, starting on January One—Cecil was inordinately curious about his new home, though I don’t for a moment believe that any place Cecil lived ever became his home. Scarcely four months in the saddle, Cecil found himself at West Acres, the regional shopping center, in the midst of displays and folks in colorful native costumes. Ever curious about local lore, he presented himself at one of the displays, one that no doubt offered an array of baked goods. “What’s behind all this celebration?” he cheerily inquired. “Why, it’s Syttende Mai!” one of the be-ribboned and hyper-aproned ladies replied, no doubt offering a sandbakkel or other goody. Innocent of our wiles and ways in these parts, Cecil followed with “What’s that?” a not unexpected question for which there was one likely reply: “Well, it’s the 17th of May.” Even without a working knowledge of the Scandinavian languages—minus Finnish, of course—this was hardly likely to satisfy Elliott, who pushed ever onward toward enlightenment. One by one the ladies glanced at one another with disconcertion and drifted off in the sense of Move along now; nothing going on here; nothing to see, because, apparently, no one knew. Silence, even in the middle of a hectic shopping center, can be deafening. 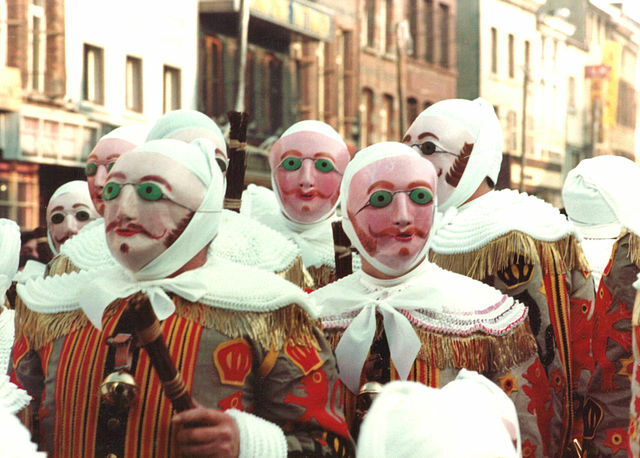 Had I a rudimentary ability in French, I wonder what sort of explanation for Carnaval de Binche might have been forthcoming.